They have a big and clean room. It they are also cleaning everyday. 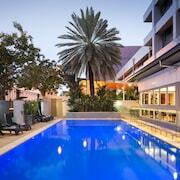 Visiting Darwin and need a place to crash? 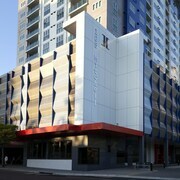 You'll find a seriously good-looking hotel rate on lastminute.com.au. If our deals were on a dating app, you'd be swiping right on every one! Want to be based in the middle of the action? No sweat. You can take your pick of an impressive 46 hotels within 2 kilometres of the city centre. The Argus Apartments Darwin and the Marrakai Apartments are some of the most convenient pads in Darwin. 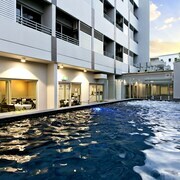 The Darwin Waterfront Apartments and the City Gardens Apartments are also worth your time. 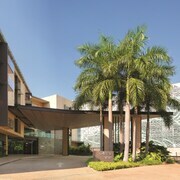 Darwin City Centre, just 0.3 kilometres away from the middle of town, is a popular suburb with 44 accommodation options. 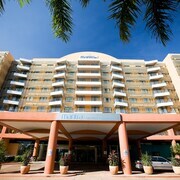 The Metro Advance Apartments & Hotel, Darwin and Mantra on the Esplanade are some recommended places. You might be shocked by the sheer number of wonderful species that inhabit the ocean. Indo Pacific Marine is dedicated to displaying a variety of these fantastic creatures. 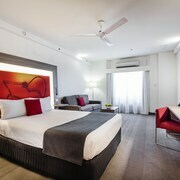 Skycity Darwin and Hilton Darwin are a couple of legit options if you and the squad are eager to stay within cooee. Whether you want to swim laps or just lay back and relax, you'll enjoy a day at Wave Lagoon. Adina Apartment Hotel Darwin Waterfront and Mantra Pandanas are two good accomodation options if you don't want to stay too far away. Budget accommodation no longer means cockroaches under the bed. Darwin YHA - Melaleuca on Mitchell is a seriously good option if you're after cheap and friendly. Or, suss out Frogshollow Backpackers. Looking for more options? 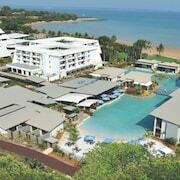 The Quest Parap is situated 4 kilometres away from Darwin, and the Quest Palmerston is 16 kilometres away. 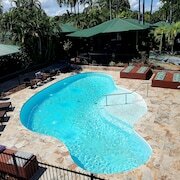 We'd also suggest the DoubleTree by Hilton Darwin and the Cullen Bay Resorts. The first is 0.9 kilometres from downtown, while the second is 2 kilometres away. Just can't keep those feet still? If you're nodding furiously, then set off and discover the wonders of the wider Top End region. Don't even think of heading home without checking out some of the region's stunning beaches, rivers and streams. Art museums and nature museums are popular sights also worth a look around. Visitors with an appetite for adventure can also enjoy a little rock climbing, mountain climbing and hiking here. Another place to kick up your feet is Batchelor, which is 70 kilometres to the south of the middle of Darwin. It is home to the Coomalie Cultural Centre and Bicentennial Park. Batchelor accommodations include the Litchfield Motel and Batchelor Holiday Park. Hopped on the last flight to Darwin? Completely worn out? Then it's probably a sensible idea to find a place to stay near the airport. The Hi Way Inn Motel and The Leprechaun Resort aren't far from Darwin International Airport, 7 kilometres from the centre of town.